Navalny brothers indicted on Yves Rocher fraud charges | Russian Legal Information Agency (RAPSI). MOSCOW, October 29 (RAPSI) - Federal investigators formally charged opposition activist and anti-corruption blogger Alexei Navalny and his brother Oleg with fraud in a case involving cosmetics company Yves Rocher Vostok, the Russian Investigative Committee announced Tuesday. The statement asserted that the Navalny brothers had embezzed upwards of 26 million rubles from the cosmetics company, as well as upwards of 4 million rubles from the Multidisciplinary Processing Company by way of a fraud scheme. The brothers were further charged with having laundered 21 million rubles, according to the statement. The Investigative Committee plans to complete its investigation in the near future, at which point it will provide the defendants, victims, and lawyers with materials for review. 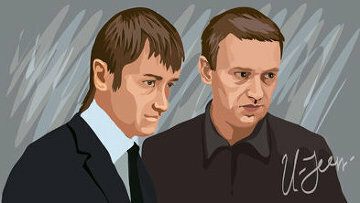 Earlier this month, the Moscow City Court upheld the legality of the present case against the Navalny brothers. In so holding, the judge rejected a motion to dismiss the case, and turned down another motion filed by the Navalny brothers requesting the right to call upon the Yves Rocher Vostok head as a plaintiff in the case, and to review the Investigative Committee’s case materials. He was initially sentenced to five years in a penal colony, and his co-accused Pyotr Ofitserov received a four-year sentence. The two were held liable to pay a one million ruble fine between them. On October 16, however, a court in Russia’s Kirov region suspended Navalny’s sentence. 19:48 29/10/2013 Federal investigators formally charged opposition activist and anti-corruption blogger Alexei Navalny and his brother Oleg with fraud in a case involving cosmetics company Yves Rocher Vostok.